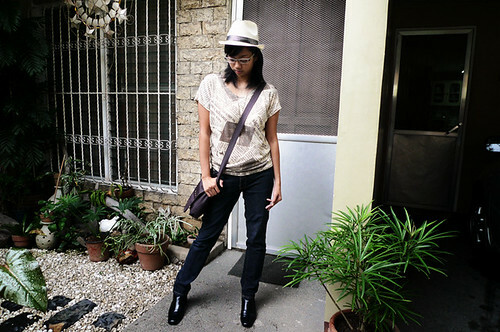 Trilby from Lucban, P75. I’ve always wanted a fedora, and when I saw this during the Pahiyas festival, I bought it at once. I didn’t notice that it’s a tad too small for me. I haven’t worn it since, and I was thinking of sell it (or giving it away) and buy another one. But I ended up deciding to keep it. It’s been in my closet for half a year, patiently waiting for me to put it on my head. Leather ankle boots from Bass, a gift from a friend. I was a bit hesitant about these boots. I mean, as many of you know, I LOVE boots, but…ankle boots? I wasn’t quite sure. I didn’t know if I had the jeans to wear them with (my other jeans keep bunching up around it), and I didn’t know if I had any other outfits to go with them. Ah, but I tried them, anyway. So I had two things I definitely wanted to use—actually, I NEEDED to use them if I was to convince myself that they had a place in my wardrobe. After many trial combinations and variations and mix and matching, I finally threw them together with my a graphic shirt from Circle C, a robot necklace from my brother (which you cannot see in this photo), my favorite unbranded jeans from Circle C, and my favorite satchel from Metrobank. And, whaddya know? I think this combination might actually be working. Yeah?